Colossus of Rhodes - The Colossus of Rhodes is one of the Ancient Wonders, that came about as the result of the Diadochi Wars. The Greek island of Rhodes was attacked in 305 B.C. by Antigonus I Monophthalmus. The assault was led by his son, Demetrius (see Diadochi). Rhodes appealed to Ptolemy I Soter of help. Ptolemy responded by sending a fleet of ships, which arrived in time to prevent the bulk of Demetrius' troops from landing. He abandoned the attack and sailed for home. The Rhodians decided to celebrate the victory by building a colossal statue to their patron god, Helios. They commissioned the services of a native born sculptor named Chares. He built 110 ft tall (33.5m) bronze statue (roughly the same size as the Statue of Liberty) at the mouth of the harbor to welcome ships as they entered the city. It's construction took place between about 294 and 282. Unfortunately it only stood for 56 years from its completion, being destroyed by an earthquake in 226. The Rhodians chose not to rebuild it fearing its destruction was a sign of displeasure from the gods. So it lied in the harbor for centuries before it was broken up and sold for scrap by the Arabs after they conquered Rhodes in the 7th century. No one today knows exactly what it looked like, but it almost certainly did not straddle the harbor as was depicted in the Middle Ages. 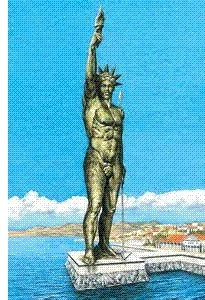 Comparisons are often drawn between the Colossus and the Statue of Liberty. Many think the Statue of Liberty was modeled on the Colossus.